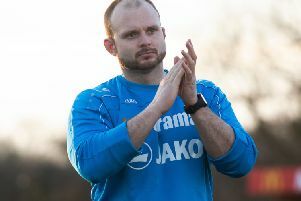 Hemel Hempstead Town have bolstered their injury-hit squad with a quartet of new signings. The Tudors have announced the transfer of Graeme Montgomery from Boreham Wood, with Daniel Pappoe, Aristote Amisi and Louis John also snapped up by manager Dean Brennan. Montgomery, 27, is a skilful left-sided midfielder who will reinforce Brennan’s desire to play attractive football. His previous clubs include Eastleigh, Aldershot Town, Dagenham & Redbridge and Wealdstone. Speaking about the acquisition of Montgomery, Brennan said: “I’ve always admired him and we really need a left-footer at our football club because we don’t have one, with the exception of Kyle Connolly. Pappoe, meanwhile, turns 22 this month and has previously played for a number of professional clubs. He captained the Chelsea FA Youth Cup side of 2010/11 but missed the end of the campaign due to injury. He returned to action with the youth and reserve teams part way through 2012/13 season, before being loaned to Colchester United where he made two appearances. Pappoe then moved to the Brighton & Hove Albion development squad on a one-year deal, and has also represented Ghana in the U20 Valais Youth cup. Amisi is a 21-year-old striker from Nottingham Forest, a Belgian national born in Congo DR, while 21-year-old John has signed on a one-month loan from National League South rivals Sutton United. Brennan added: “We’ve been busy and we are still trying to get a few more in because we are short on numbers. We’ll see what we can do. “We will give them an opportunity and it’s down to them to take it. Obviously there’s a reason why they’re not playing but there’s plenty of ability out there, we’ve just got to go and find them. “They are all young players, with the exception of Monty who is 27, so they will get an opportunity at the club and we will see if they can perform. “We know that they have got ability, they’ve got a good pedigree. We had 12 or 13 targets in the summer and only got three of them.